Here's a clip from 'Paul' which has a Valentine's Day release date for us in Ireland and the UK and what better way to express your love than watching Simon Pegg and Nick Frost on a Alien odyssey. The clip shows Pegg, Frost, Paul (voiced by Set Rogen) and Kristen Wiig round the camp fire par taking in some wacky tobacky. 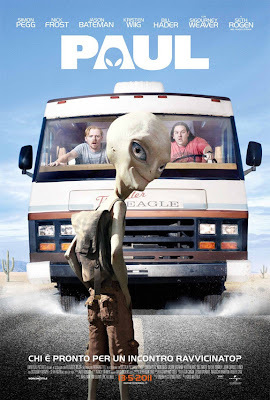 Directed by Greg Mottola, 'Paul' also stars Joe Lo Truglio, Bill Hader, Sigourney Weaver, Jason Bateman, Blythe Danner, Jane Lynch and Jeffrey Tambor. People in the US will have to wait a bit longer as it has 18th of March date.